Why are these women attractive? Are they powerful or being possessed and caught within the frame? Do they represent Victorian women's positions (of being constrained, of being either angel or whore)? Or are they signs of liberation as the Sarah in The French Lieutenant's Woman represents at the end of the novel? Can you find contemporary counterparts to them? What are the dominant Taiwanese images of women? Please also look at specific questions about the paintings and photos. "The Pre-Raphaelites sought ...to restore to painting the naturalness and simplicity they insisted it has lost after Raphael by demonstrating in their own art the superiority of realism--freshly observed nature transferred to canvas--to timid emulation. the persistent ramantic-Victorian attachment to the Middle Ages. mixture of mysticism and "fleshlines" (i.e. sensuousness) especially in connection with female subjects. "As artists, the women were less clearly successful than the male Pre-Raphaelite painters. As images, however, they dominate the scene. There are in fact three main types of Pre-Raphaelite 'stunner,' which correspond in part to the phases of Pre-Raphaelite art and in part to the ideas of feminity current in the Victorian age. III. the third--the dark, enigmatic Feminine (e.g. Jane Morris)" (Marsh pp. 27-28; underline, boldface & parentheses added). IV. The women's roles in "The Blessed Damosel"--1. draft; 2. final; 3. poem. 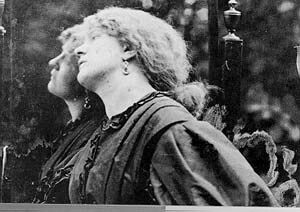 V. Christina Rossetti as "an honorary Pre-Raphaelite Sister" ? Aesthetic Pre-Raphaelitism (also a caricature of Pre-Raphaelite Circle). 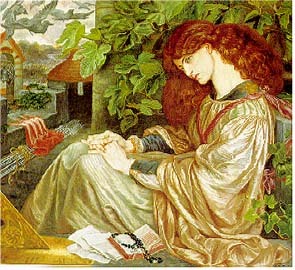 the formation of Pre-Raphaelite Brotherhood. Fanny Cornforth became somebody else's housekeeper. Dante Gabriel Rossetti criticized as "the Fleshly School of Poetry"
I. Elizabeth Siddal As a milliner's daughter, she lived under very limited circumstances when she met DGR. "Rossetti fell in love with the pale, red-haiired milliner and transformed her life by encouraging her own pursuit of art" (Marsh 21). "...Beata Beatrix, inspired by DAnte's Vita Nuova and portraying the beloved at the moment of her transition from earth to heaven, was the artist's mourning tribute to his wife... [It] has always been interpreted as a strong if somewhat sentimental token of the artist's grief and guilt, .... 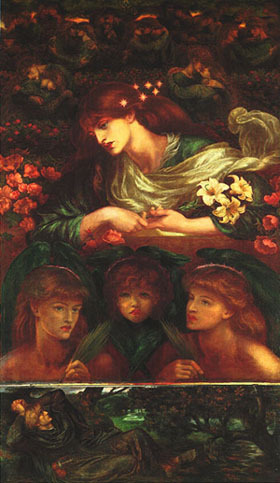 It is, however, also a truly marcabre image, of the beloved woman at the moment of death, painted in the sensuous style of Rossetti's middle period, and its sense of necrophiliac longing is hard to evade" (Marsh 141-42). pay attention to the use of symbols: the man (Dante) and the woman (Love) at the back, the sundial, the red dove, etc. III. Jane Morris cast as Pandora, Prosperine and the poor Pia. Why? To show DGR's love for her, sympathy with her conditions, or to contain her power in his paintings? How are these two different? How are these two paintings different? References:Jan Marsh. The Pre-Raphaelite Women: Images of Femininity in Pre-Raphaelite Art . London: Weidenfeld and Nicolson, 1987. Richard Altick. Victorian People and Ideas. NY: Norton, 1973.